This oil on canvas by Marcelle Ferron is a testament to her understanding of rhythm and composition. Strokes of bright yellow, blue, purple, red and black are offset by large planes of white in this compelling structure of colour. 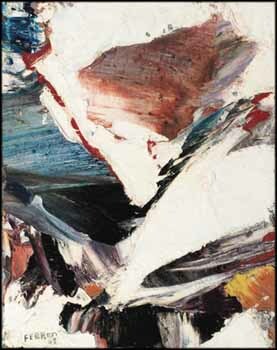 Caprican was painted in 1959, during her Parisian period (1953 to 1966), when she began experimenting with the very materiality of her medium. Laid down in thick swoops, her impastos reveal the grainy texture of the paint that she would mix herself from pure pigments. In art critic Robert Enright's words, her paintings ''have an irresistible physical presence and an equally compelling rhythm.'' Highly dynamic and engaging, Caprican is an emblematic piece from her best and most coveted period. Ferron was a signatory of the 1948 Refus global manifesto and one of the leading figures of the Automatist movement. Throughout her education, she worked under some of the most significant artists in Canadian art history, such as Jean Paul Lemieux and Paul-Émile Borduas.